Kanteen is in probably the best spot in Melbourne to sit and a have a coffee. Easy to park, easy to find, great view. Unforunately everyone else in Melbourne thinks so too... which means it's always busy!! On the weekend there is nothing better than to jump on your bike and ride along the Yarra and stop in for a quick coffee hit. The place is completely unpretentious and is obviously driven by the proprietors passion for great coffee and food. As far as I'm concerned this cafe makes the best coffee in Melbourne. Always served exactly as you asked for it, not too hot and never bitter. Having said it is always busy, the best time to visit is on a weekday. Try to get away from work for a little time out by the river. You always get a seat and the service is much faster than on the weekends. Their egg speciality is poached eggs on a cheese melt [ham, cheese and tomato on rye bead]. 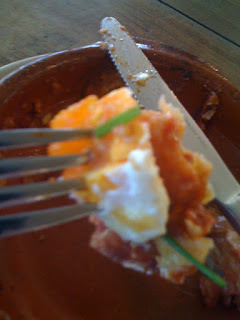 On my last visit I had the spanish baked eggs. This was just about the best breakfast dish I have ever eaten!!!! Designed to perfection it encompasses a small baking dish with a layer of bread in the bottom, with eggs, chorizo, goats cheese and chives. The eggs were cooked to perfection and the chorizo added just the right amount of heat. All finished off with the tart creamyness of the goast cheese. Fantastic. The remains of my Spanish Eggs!